Banska Bystrica Several separate conversations struck me as we visited with villagers and others around central Slovakia, and both came together around the issue of social benefits, or what we would call welfare payments to out of work or otherwise financially imperiled families. On one hand, the classic, and racialized, discrimination is obvious when Slovakians talk about the Roma minority in their communities, and similar to the way this works in the United States and so many countries, part of the attack and the prejudice is the allegation that none are working, but instead are simply cashing their social benefit checks. Yet, as always, when talking to families, many want to work, have employable skills, but lack opportunity and contacts sufficient to scale the walls of discrimination. It is probably needless to say that the actual benefits are very small and in and of themselves insufficient to support adequate living standards. Politicians in Slovakia, like so many in the rest of the world, respond and reflect this prejudice by imposing work requirements, increasing the popularity of the prejudice. In Slovakia, as I appreciate, any able-bodied man or woman receiving benefits must work 4-hours per day in service to the local municipality or other public employers, if no other work is available. The other conversation that struck me was with the young mayor of a small village of 1100 that we visited. His complaint was that he had more work in the community than could be handled by the four-hour a day work requirement. He wanted to be able to pay the benefit recipients for more hours, so that they could get more of the village’s work done, but was unable to do so. The reason was that any additional income earned by the recipients would be clawed back from their benefit checks, which made it impossible to get people to work, essentially for nothing for the extra hours. Under questioning, he said that in regional meetings of other mayors he had talked to many of them, and they felt the same way. 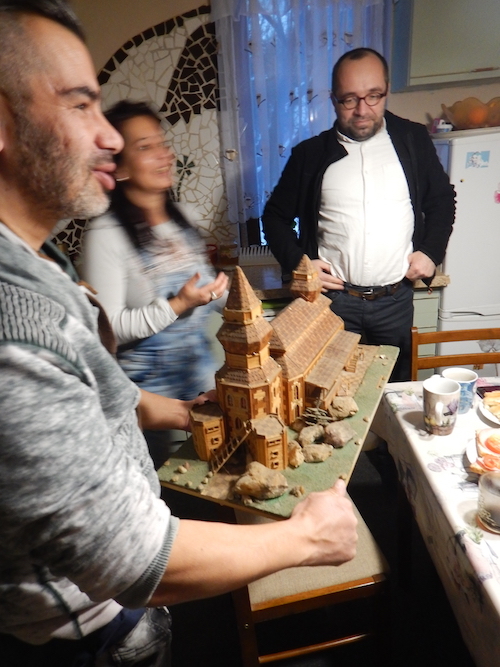 When I talked to Roma organizers in another village later in the day at their home, I asked them whether people they knew on benefits wanted more hours and access to potential jobs. The answer was an immediate yes. I told them about ACORN’s campaign in British Columbia that had been successful in reversing the government policy on clawbacks, and about ACORN’s ongoing efforts in Ontario on this same issue. Were they interested? Heck, yes, I had them “at hello” and a promise to send them more information on the ACORN Canada effort. When I asked the frustrated mayor whether he thought he might have more chance at convincing the regional government to change the clawback policy for welfare recipients if there was an organized voice of participants behind him, his answer was also, heck, yes! Whenever you find that both the participants and the potential targets have a mutual interest and an unstated and unexplored agreement, it is clear to any organizer that the leverage exists for a potential victory on a major issue. The only thing that remains is the obvious first step: doing the hard work of organizing. In central Slovakia a huge victory for low income families is now waiting. We need organizers to take the next step and work with leaders and families to build the organization and the actions to make the demands. Power is lying even on these small roads in these villages for people to pick up, take it to the next step, and make permanent change.